Once again…..there is sadness in our home…..Blake and I lost another one of our beloved PSBR “Oldsters” to old age this past winter. Yeti came to us October 23, 2010. We had recently lost JuJu Bear, and there was an emptiness in our hearts that needed desperately to be filled. Enter – Yeti!!! Oh what a sad story he had to tell….he was picked up as a stray and probably had been living on the streets for some time…….we were told he was a “Pomeranian/American Eskimo mix, although we’re not sure about the American Eskimo”…….in the photo – he was so tiny – we were told he weighed only 6 pounds when he was found – and a photo that came with him showed him fitting into the hand of the technician at the vets. And fur, well – he had almost none – he was just a lot of pink……But his photo – he was the cutest little thing…….we wanted him! Through the amazing efforts of all the wonderful PSBR volunteers – he was “convoyed” from his foster mom in Ridgetown to Guelph where we adopted him on the spot!! It was quickly determined that he would be mommy’s dog…………. he sat with me on my lap for the hour or so car ride home, but when we made a stop for me to run a quick errand, he became terribly upset when I left the car. Once home, he quickly became part of the family!!! He was SO happy!! Although we quickly found out he was VERY much the jealous type (he was constantly competing for mommy’s affections with her beloved Bepino), he loved being part of a large fur family!! He quickly attached himself to Scout – later identified as “Girlfriend”, and remained attached to her till he passed away. One of our most fun first memories was of him and Scout running back and forth in the backyard……with poor Bepino desperately trying to keep up with them, and Mia, standing on the porch, watching (she would have none of THAT silliness)!! Within four months – he was back to complete health – the 8 pound pink skinned dog with tufts of fur quickly filled out to a healthy 12 pounds, and his fur just kept growing in……. 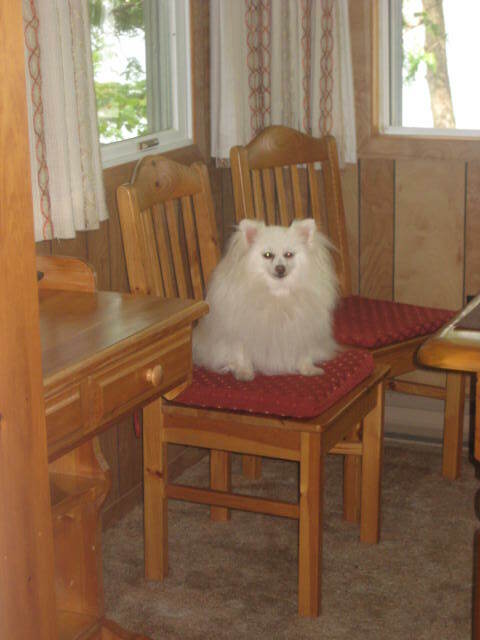 And we quickly learned……not a trace of Pomeranian in him – all American Eskimo!! So agile – he used to jump on everything – he would jump up on to the picnic table so as to watch me while I did my outdoor projects. He was fiercely loyal and protective – it took quite some getting used to. I would enter a room and when I turned around – there he was – sitting in the corner…..watching….waiting….He followed me everywhere……I have photos and memories of him in every corner in every room…….in the basement as I did the laundry, beside the fridge as I made meals……on the arm of the Muskoka chair as I drank the morning cup of coffee…..in the car – he sat on my lap – or at my feet on the floor (that took some getting used to – none of them ever sat there)……I have to admit though – my favorite “Yeti Spot” though was as I sewed at the cottage…….I would just put his bed on the sewing table beside the machine – and up he went and sat as I sewed….watching…..waiting patiently…. But he loved his daddy too!!! Car rides with daddy….out in the paddle boat or boat – daddy’s boating companion….or helping him with all the outside chores – such a big help!! He was so much fun and full of life…he was full of fear walking at home in the city streets…the traffic never stopped upsetting him………….but – at the cottage – where he had a chance to run on the country roads – he was in his glory! And living up to the “American Eskimo” name – he loved snow!! He loved to eat it – what a tasty treat…he would run along the road at the cottage, eating the freshly fallen snow as he ran…..and is there anything happier that a Yeti rolling and rubbing in the snow!! He loved the car – we would open the door – and the next thing we knew – there he was sitting in the car! We wondered – as indeed did the foster mom…..that perhaps he might have belonged to someone who drove in his work life – and maybe he somehow got separated from his previous home. He loved the cottage…..his favorite spot was to position himself on the back at the corner of the L-shaped couch – from there he could stand on guard – he could see everything and everyone…….he could see who was coming down the driveway from the road…..he could see as all boat traffic appeared……he could see anyone coming to the side door………All needed to be beware of the protection of Yeti! But, old age eventually found him – we never knew his age, but we were told he was probably 8 or 10 years old when he was found. November 2015 saw the start of some heart issues. He managed fine though………but last September he started to take a turn for the worse – we thought we were going to lose him one weekend. But our vet came through again…….Yeti learned to take inhalers twice a day, and was able to bounce back…. Its been a few months now, and I cry as I write this……we miss him terribly……we miss them all….Our home is too quiet….. But once again, Blake and I would like to thank Sylvana and all the amazing volunteers of the PSBR…….we’ve been blessed with 5 wonderful loving Oldsters through all the hard work they do….